With North Korean cyber attacks on the rise, South Korea is acquiring preemptive cyber strike capabilities. South Korea is developing offensive cyber capabilities to counter the growing number of cyber attacks it faces from North Korea, the ROK Defense Ministry announced earlier this week. To date, South Korea has relied on passive and defensive cyber operations to counter cyber attacks from North Korea. However, as Tae-jun Kang notes over at the Koreas blog, North Korea has been stepping up its cyber operations against the South in recent years. Cyber attacks originating in the North were up over 35 percent in the first nine months of this year, and South Korea’s Defense Ministry estimates that North Korea has nearly doubled the size of its cyber command over the last two years. The Korea Herald reports that during a parliamentary audit on Wednesday, a Defense Ministry official told lawmakers that the North’s growing cyber capabilities have forced it to abandon its previously defensive cyber doctrine. “We will change what has so far been a passive-defensive policy into a proactive one. Taking advantage of the enemy’s vulnerabilities, we will take preemptive action to fend off cyberinfiltrations,” the unnamed Defense Ministry official was quoted as telling lawmakers. Another anonymous military source elaborated on the nature of the changes. 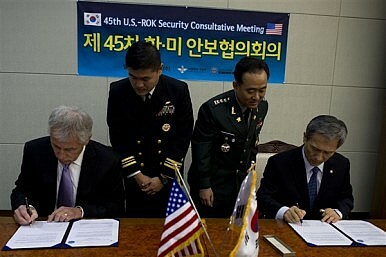 “[To date] The military had focused on monitoring-based operations to deter enemies’ hacking attempts, but now we will proactively detect hosts of such attacks online and launch preemptive strikes to prevent them from victimizing us from the outset,” the source was quoted by Yonhap News Agency as saying. To beef up its capabilities, South Korea plans to train 400 new cyber troops to bring its total number of cyber warriors to around a 1,000. The 400 new cyber warriors will operate as part of the Cyber Command South Korea’s Ministry of National Defense created back in 2010 as the sophistication and frequency of North Korea’s cyber attacks began increasing. As The Diplomat has pointed out in the past, cyberwarfare presents an opportunity for the North Korean military. To begin with, the plausible deniability of cyber attacks also suits North Korea’s desire to constantly provoke South Korea without sparking a war that it would surely lose. Cyber capabilities also play into North Korea’s larger military doctrine of acquiring asymmetric capabilities that can help compensate for the vast inferiority of its conventional military forces compared to South Korea and the United States. Furthermore, cyberwarfare suits North Korea because of the huge asymmetry between the two Koreas’ vulnerabilities to cyber attacks. On the one hand, as one of the most wired nations on earth, all parts of South Korean society are highly vulnerable to cyberattacks. This stands in sharp contrast to North Korea which, despite growth of its national intranet system in recent years, doesn’t rely on the internet to same degree as most nations in the world, particularly modern ones like South Korea. 'Left-of-Launch' Cyber Efforts Against North Korea: A Good Idea?Japan's Fearsome World War II-Era 'Zero' Fighter Takes to the SkiesIran: The West's Most Dangerous Foe in Cyberspace? The Sony Case: Another LookIs China’s Cyberwar Capacity More Backward Than We Think?